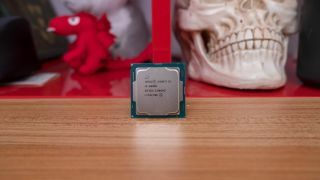 Intel’s rumored octa-core processor has been benchmarked again and curiously the results were blurred out in the AMD Ryzen Threadripper 2990X test results we reported on earlier this week. Komachi tweeted an undoctored version of the screenshot to reveal an Intel 8-core Coffee Lake-S processor achieving a Cinebench score of 2,212 points. Comparatively, AMD’s latest Ryzen 7 2700X achieved a Cinebench score of 1,798 points. If Intel intends to add more cores to close the gap with Ryzen 2nd Generation’s incredible multi-core performance, it seems this Coffee Lake-S will achieve that goal. The brief specs listed in the Cinebench screenshot also details that the Intel’s mystery octa-core chip features 16-threads and 3.1GHz clock speed — which we hope is the CPU’s base frequency. Although this info dump looks tantalizing, we’re not going to put much stock into it. The screenshot could have easily been photoshopped to include any processor of our dreams. So, we’ll wait for Intel’s official announcement of such a CPU before we start celebrating.